Find bike routes that match the way you ride. Share your cycling knowledge with the community. We are sorry to say that we have shut down Cyclopath. We thank you for your support over the years! 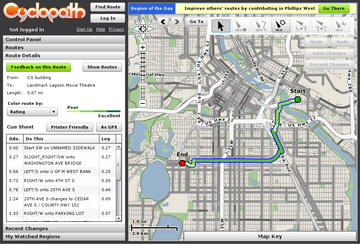 Cyclopath was not only a resource for the Twin Cities bicycling community, but it was a research platform that facilitated computer science education at the University of Minnesota, and contributed to our scientific understanding of geographical information systems and social computing. Priedhorsky, R. The value of geographic Wikis. (University of Minnesota, 2010). Masli, M. N., Priedhorsky, R. & Terveen, L. Task Specialization in Social Production Communities: The Case of Geographic Volunteer Work. in Fifth International AAAI Conference on Weblogs and Social Media (2011). Torre, F., Liu, Y., Liu, Z. & Terveen, L. Local Knowledge Matters for Crowdsourcing Systems: Experience from Transferring an American Site to China. in Seventh International AAAI Conference on Weblogs and Social Media (2013). The National Science Foundation, grants IIS 05-34692 and IIS 06-26930. The Cyclopath concept originated in discussions with Doug Shidell, Little Transport Press. Geocoding (address to location translation) by Microsoft Virtual Earth group. Last but not least, Cyclopath worked only because of the attention and care of its user community -- that means you.